A native–born Pennsylvanian, Marilynn Nicholson earned a Bachelor's Degree from Moore College of Art and Design in Philadelphia, and later received a Master of Fine Arts Degree from the School of American Craftsmen at the Rochester Institute of Technology in upstate New York. Her education has been supplemented by numerous workshops and courses, including several at The School of Jewelry Design and Silversmithing at Birmingham Polytechnic in Birmingham, England. She also studied at the Tyler School of Art in Pennsylvania and at the Worcester Crafts Center in Massachusetts. Additionally, Ms. Nicholson has completed courses in Mexico at the Instituto San Miguel De Allende and in Denmark at the Danske Selskab Danish Design Seminar. Marilynn taught Jewelry Making, Weaving, Foundations, and Two– and Three–Dimensional Design, both at Trenton State College in New Jersey and at Rhode Island College in Providence. Her teaching continued after she married and moved to England in 1973. During her 12 years in England, she taught part–time at Hereford College of Art and at Malvern Hills College, and also conducted workshops for the Association of British Craftsmen. Marilynn Nicholson has worked as a self–employed jeweler since 1973. Her career has been highlighted by exhibits in England, Germany, Japan, Israel, Switzerland, Australia, and the United States. Her extensive list of one–person shows includes exhibitions at the Victoria and Albert Museum and Goldsmiths' Hall in London, the Birmingham Museum Art Gallery in Birmingham, England, and the Heimat Museum in Idar–Oberstein, Germany. Her jewelry is also included in permanent collections in England at the Victoria and Albert Museum, Goldsmiths' Hall, the Birmingham Museum Art Gallery, and the West Midlands Art Collection at Shugborough Hall in Staffordshire. While living in Britain, Marilynn also wrote reviews for publication in association with London's Goldsmiths' Hall and the Society of North American Goldsmith's magazine, Metalsmith. 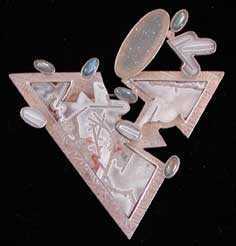 In New Mexico, she has documented workshops for the New Mexico Metals Association Newsletters	and has been featured in several articles published in Lapidary Journal. Marilynn's jewelry was also included in an exhibition and book, “Treasures of the 20th Century” published by Goldsmiths' Hall to celebrate the year 2000. 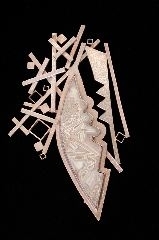 Since 1986, Marilynn has lived and worked as a self–employed jeweler and has taught part–time classes and workshops for The University of New Mexico, The Taos Institute or Art, Santa Fe School of Metalsmithing, Pueblo 5, The Oo–oon–ah Art Center at Taos Pueblo, The Firehouse Art Center, and The Armory Art Center. Marilynn loves to travel and she enjoyed visiting Japan in 2005 to give a lecture about her mechanism designs at an international conference and exhibition at the museum and jewelry school in Itami, Japan. Future workshops and lectures in 2010 will take place in Tucson for the Arizona Designer Craftsmen and in Florida for the Armory Art Center, West Palm Beach, and the Florida Society of Goldsmiths Northeastern Chapter at Daytona Beach. Marilynn continues to cut stones and make jewelry and shows at invitational exhibitions throughout the year. Recently her jewelry has been included in a lavishly illustrated wonderful book “Agates II” by the German author, Johann Zenz. Marilynn's work will also be included in the Lark publication, “500 Gem and Stone Jewels” and in the January 2010 edition of Jewelry Artist magazine. A complete resume is available on request. Marilynn Nicholson fabricates her jewelry in a collage–like style using nature as an inspiration. Landscape, clouds, plant forms, the structure of stones, and often the processes used in forming metals, all provide inspiration. In constructing jewelry, she consciously looks for materials that add surface contour to designs and enhance the dimensional effect of the piece. Marilynn likes to think of her jewelry as small, wearable pieces of sculpture and cuts many of the stones used in her pieces. Agates have particularly striking patterns and their unique qualities often influence the irregular shape of her stones. Gemstones have a primeval feeling that reflect in their structure the evolution of the earth . At times the jewelry follows a theme in which each piece is connected to the others in an effort to explore an idea in all its facets. An experimental approach is used in constructing settings for stones and mechanisms. Total design is the essential consideration, but most importantly, the jewelry must relate to its owner and be comfortable to wear.